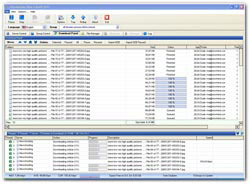 NFO reader & NFO viewer, Open NFO files with NFO viewer software. What is NFO file format? .nfo (a contraction "information") is a commonly used three-letter filename extension of ASCII or extended ASCII text files that accompany other files and contain information about them. Such NFO files can be viewed with text editors or dedicated NFO viewers. NFO files usually contain release information about a software program. NFO files were common, and sometimes required, during the era of the BBS. A typical warez NFO file was elaborate and highly decorated, and usually included a large ASCII art logo along with software release and warez group information. How to view NFO files? Many users who download program files on the internet find it difficult to open or view NFO files. To open a NFO file, you need a NFO Reader or NFO Viewer. NFOPad is a small, fast and flexible combined nfo viewer and text editor. It is a clone of Microsoft's Notepad but with extra settings, and support for nfo files. The file extension is used to determine whether to use an ANSI or ASCII font. NFOPad also fully supports Unicode. 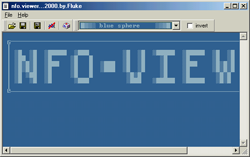 Compact NFO Viewer is a popular viewer for text files containing ASCII Art and description files (NFO/DIZ/TXT). It is designed for viewing text files containing ASCII Art (e.g. nfo files), and it proved itself to be handy. So, if you're fed up with starting some DOS-like file manager each time you need to view nfo file, or ain't too happy with the viewer you use, or (worst case) use Notepad - give this little tool a try. 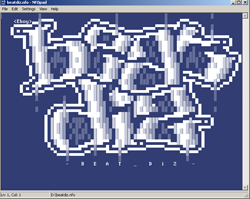 This NFO-Viewer displays any .nfo or .diz art completely correct by using a font, which consists of all the characters used in the DOS-ASCII character definition. During the time NFO-Viewer is running, this TrueType font is installed to the Windows fontpool under 'NFO Font Temp-Install...'. Ultraleecher is more than a classic Newsreader, Ultraleecher joins all the features and popular feature requests from the best Readers available and completes these features with a powerful CD/DVD Burn Engine, a highly secure encryption module to save your privacy, a great Script Engine and a comfortable Thumbnailviewer for your pleasure.